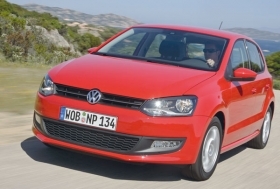 Strong demand for the Polo helped VW group and VW brand each increase Europe sales by more than 10% in January. MUNICH -- Europe's eight-biggest automaking groups started 2010 with gains in new-car registrations, according to data from European automakers association ACEA. But automakers are not celebrating because they know the increases are due to nearly finished scrapping incentive programs in key European markets and a comparison with terrible sales numbers in January 2009. Most industry watchers expect western Europe new-car registrations to fall by at least a million units in 2010 due to the end of scrapping incentives that artificially inflated sales by offering cash to customers to traded in old cars for newer models. The incentives revived the European car market, which managed a fall of just 1.6 percent to 14,481,545 sales in 2009, despite the global slump. An indication of how automakers are bracing for the predicted decline came last month when Volkswagen AG Czech unit Skoda said it would cut production of its No. 2 seller, the Octavia compact, to 441 vehicles a day from 574 starting in March. The announcement came just days before ACEA reported that Skoda's January sales in Europe rose 29 percent to 32,983 units. Italy was Europe's sales leader in January with a volume of 206,341 units. The 30 percent rise is attributed mostly to orders made in 2009 as the country's new-car orders actually fell 10 percent last month to about 125,000 vehicles, foreign carmakers' association UNRAE said.